Errol: And the camcorda saga continues! I can’t believe the number of comics this is taking up. Whitless: Shopping for me is like jumping into a cold pool. Just take a deep breath, get it done as fast as possible and hopefully you won’t scream like a little girl. I do the research, get the product, and go. 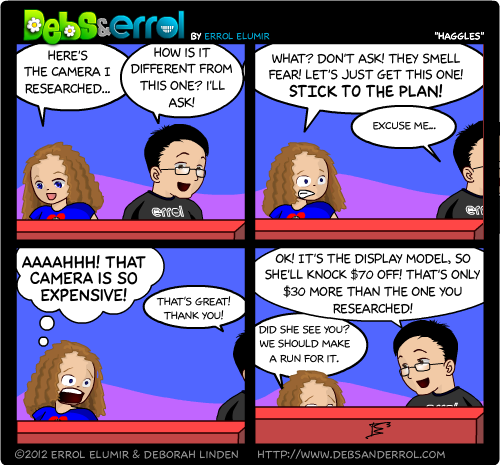 But because of this, I tend to not get any deals :P. This is why having Errol is good. He’s the endlessly curious questions man. We ended up getting a nicer camera in the long run! There are certain types of items I hate trying to buy, with jewelry probably at the top of the list. There is no reality when shopping for jewelry!!! Appraisal price, list price, asking price, sale price, discounted sale price, “for you, we’ll make a deal” price, rock-bottom final price…aaaarrrghh! I don’t even think I’ve stepped into a jewelery shop!